*An African film company is gaining global attention by producing award-winning 3D animation titles made from an African perspective. 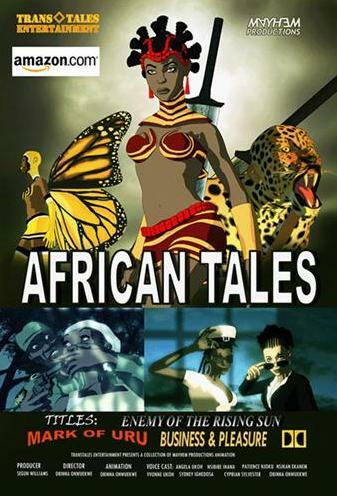 TransTales Entertainment was started in 2005 on a budget of less than $5,000 dollars by Segun Williams and Obinna Onwuekwe, and is the first film company to produce African themed 3D animation films to fill the void in animation with myriads of authentic African stories. The titles produced by TransTales are widely acclaimed by industry experts and the animated series “Mark of Uru” recently won the United Nations World Summit Award for the use of technology to promote African culture. According to the UN World Summit Awards website, “Mark of Uru” is an exciting web animation series combining digital expertise with local folk story, imagery and culture. In “Mark of Uru”, Azuka is a girl born with a birthmark identical to the tattoo of a sinister sorceress Uru, who died long ago. Despite her mother’s effort to conceal the birthmark, it is eventually discovered, and the annihilation of the child becomes imminent, in order to protect her people from the curse of Uru. The intervention of the earthbound elemental spirit Isi-Agu and his protégé Etido forestalls Azuka’s execution. She is taken to a sacred mountain well beyond the reach family, friends and foes. The moment she grows into a woman under the protection of Isi-Agu and Etido, the news of her survival sparks a deadly manhunt initiated by people bent on her annihilation. With the assistance of a band of outcasts, she embarks on a grueling journey, through the most treacherous terrains to unravel the mystery behind her bizarre birthmark. For more information, visit www.transtales.com.